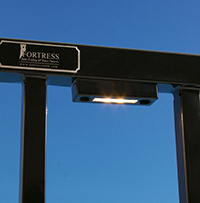 Fortress Accents was created by a national brand that is known for quality and innovation, and these new LED lights are no exception. 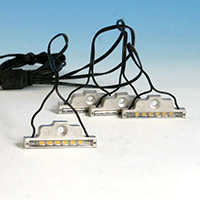 This complete line of products includes: Vertical LED Post Light, Universal LED Light, Surface Mount Recessed LED Light, LED Cap Light Module, Flat Pyramid Post Cap, and LED Transformer. All Fortress Accents LED lights use a unique, built-in thermal management system which ensures that the LED will have a long life with a consistent color temperature. These versatile LED deck light are made from durable, powder-coated, die-cast aluminum and contain a long-lasting, waterproof LED that uses 80% less energy than a traditional incandescent fixture. 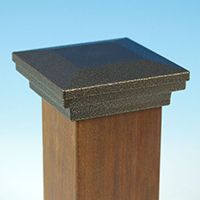 The Flat Pyramid Post Cap by Fortress Accents has a low-profile design with premium finishes that creates style and elegance in any outdoor space. 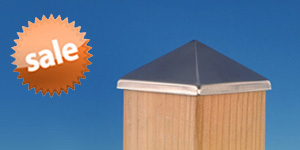 This versatile cap easily slides over metal, wood, vinyl and composite posts. Available in black, white and antique bronze finishes as well as 2-1/8", 3-1/16", 3-5/8", 4-1/8" and 5-1/16" sizes. 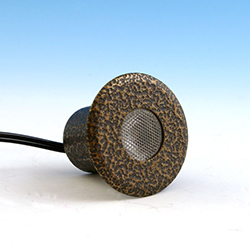 The 5-1/16" cap also includes a 4-5/8" adapter for use with a 4-1/2" post. Transform this Post Cap into a lit cap with an LED Cap Light Module by Fortress Accents (sold separately). Take the Flat Pyramid Post Cap by Fortress Accents from ordinary to extraordinary by simply adding the LED Cap Light Module during installation. Offering maximum versatility, this deck lighting systems allows you to light one, two, three or all four sides of the post cap. Simply choose how may sides you would like lit, clip the wire of the unneeded LED module(s) and wrap the ends of the clipped wire with electrical tape. Sold individually or in 4-packs. The Universal LED Light by Fortress Accents features a low-profile design and can go virtually anywhere more light is needed. 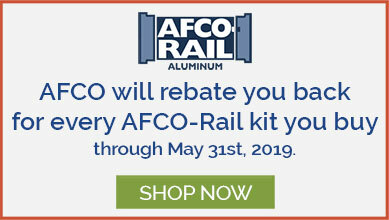 They are great for lighting under rails or on steps. This versatile light is made from durable, powder-coated, die-cast aluminum and contains a long-lasting, waterproof LED that uses 80% less energy than a traditional incandescent fixture. Sold in 6-packs; available in Gloss Black, Gloss White, and Antique Bronze. The Surface Mount Recessed LED Light by Fortress Accents is perfect for lighting in the deck surface or deck stairs. These LED deck lights are easy to install using a 1" forstner bit (sold separately); they simply pressure-fit into place and sit virtually flush with the deck surface. This versatile light is made from durable, powder-coated, die-cast aluminum and contains a long-lasting, waterproof LED that uses 80% less energy than a traditional incandescent fixture. Sold in 2-packs; available in Gloss Black, Gloss White, and Antique Bronze. 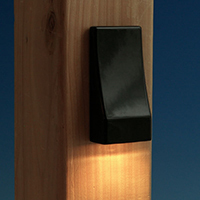 The Vertical LED Post Light by Fortress Accents features a low-profile design that is great for metal, wood, vinyl and composite posts measuring 2" and up. This versatile light is made from durable, powder-coated, die-cast aluminum and contains a long-lasting, waterproof LED that uses 80% less energy than a traditional incandescent fixture. Sold in 2-packs; available in Gloss Black, Gloss White, and Antique Bronze. 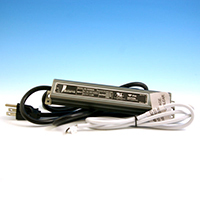 Bring life to your Fortress Accents LED lights with this 30 Watt Transformer by Fortress Accents. This DC transformer is suitable for wet locations and comes with a 2-year manufacturer warranty. Whether you want to add a little or a lot of light to your deck, fence or landscape, the new line of LEDs by Fortress Accents is sure to enhance your project. 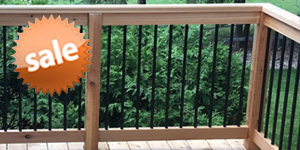 The complete line of Fortress Accents products are availabe here at DecksDirect.